Oh sleep cycle, how I tend to screw you up so? Bed at 11:30pm, awake at 8:30am. Bed at 4am, awake at 9am. Bed at 4am, awake at 1pm. Bed at 10pm, awake at 5am. It’s conformity to believe that we must all be awake when the sun is up. But some things cannot be done when the moon holds court in the sky. Oh this future we live in, where not everything is open 24 hours. Such a demand to be awake and aware in the daylight hours. I’m sorry sleep cycle, I’ll try to keep you on a more regular cycle. But if I didn’t change it up here and there, dear sleep, you’d get just as boring. 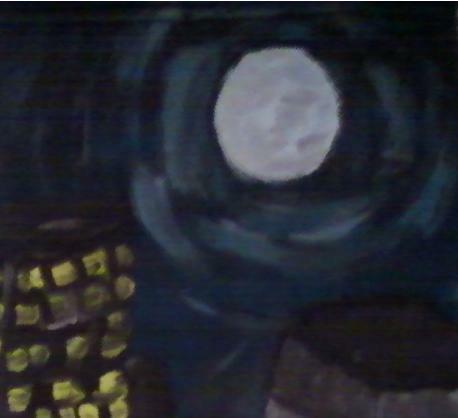 Moon from part of the city scene from one side of the lamp shade I'm painting for my mom. Sailing through the night sky, through the clouds, and over the horizon. These dreams we have, these travels we plan, of adventures in far off lands. Wanting to reach up and touch the moon, but settling for laying underneath it. On the sand that still holds some of the warmth of the day, just laying there and counting the stars. Anywhere else that I could be, I rather not be. Here with you is where my heart belongs. The moon rises out of the sea, just like my love for you rises up and fills me; just like the full moon fills the sky. At 4 am, everything is mysterious. At 4 am, the shadows are as long as they are going to get. At 4 am, anything is truly possible. At 4 am, I am missing you. At 4 am, the world is perfect for an adventure.